The Jandy Ray-Vac automatic pool cleaner is designed to both vacuum and sweep your swimming pool. The Jandy Ray-Vac automatic pool cleaner is designed to both vacuum and sweep your swimming pool. The cleaner head moves in a random submerged pattern about the pool, traveling, vacuuming and cleaning from the pool floor to the water line. The cleaner head moves in a random submerged pattern about the pool, traveling, vacuuming and cleaning from the pool floor to the water line. Cause: Filter system off. Unit in backup cycle. Dirty Finger Screen or Energy Filter. Hole in hose. Backup Hydro-Timer releasing most of the water out of the discharge hole. Transporter jet plugged. Solution: Check time clock. Normal operation. Clean Finger Screen or Energy Filter. Replace defective hose. Replace defective backup jet gear assembly. Clean or replace the transporter jet. Pool cleaner stalls in corner. 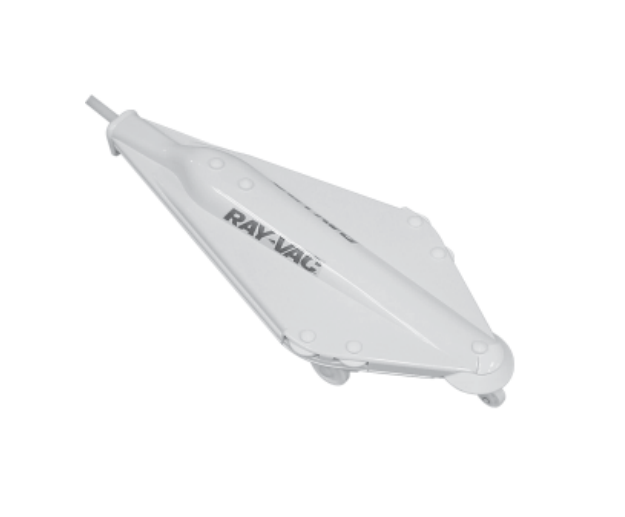 Cause: Corner restricting movement of Ray-Vac. Nose caster wheel jammed with debris. Increase backup. Solution: No adjustment needed. Wait until backup jet pulls unit out of the corner. Clean or replace. See instructions under speed adjustment. Pool cleaner stalls in skimmer. Cause: Skimmer opening is larger than Ray-Vac. Increase backup. Solution: No adjustment needed. Wait until backup jet pulls unit out of corner. Add optional skimmer guard. See instructions under speed adjustment.